Western snowy plovers have left Sitka Sedge State Natural Area for the summer, and recreation restrictions have been lifted. Note that motor vehicle restrictions unrelated to shorebirds are still in place. Please the follow the posted instructions. Nehalem Bay still has plovers on-site, and recreation restrictions are in place through September 15, along with the other occupied sites from Florence down to Floras Lake. Check the maps for more site specific information. In these areas camping, dogs, kites, vehicles (including bicycles) are prohibited; pedestrians and equestrians can traverse wet sand only. We all love to play on the beach, the same beach where many species of shorebird and seabird forage, rest, and nest. With habitat degradation from urban expansion and invasive plants like European beach grass, our sandy beaches are getting more narrow. This pushes birds, people, pets, and predators into tighter and tighter areas. This adult western snowy plover is sporting color bands. Each adult bird band combination is unique, like giving them names. Shorebirds come in all sorts of sizes and shapes, and during migration thousands of them coarse along the Oregon coast, pausing to fuel up on crustaceans and other invertebrates that live in the sand. Each species has its own foraging tactic – probing, sifting, pecking – with a unique bill and legs to give them an edge on their prey. Sometimes when people see a large flock of shorebirds, the temptation to rush into them and watch them fly up and away is irresistible. Shorebirds often perceive dogs as predators, and indeed many beachgoers encourage their dogs to chase after foraging shorebirds. These disruptions may seem harmless and fun, but they take a large energy toll on the birds, many of which are migrating thousands of miles along the coast to reach their breeding or wintering grounds. Can you imagine running 100 miles, stopping for something to eat, and then never getting more than a bite or two before a semi truck charges right at you? That’s what it is like for many shorebirds. It is even harder on beach nesting birds, like the Caspian tern or the threatened western snowy plover. Repeated disruptions don’t just affect the adults; disturbance also impacts the nest, eggs, and chicks. Without a parent to protect them, they often succumb to weather or predators. Many birds only have one or two seasons to try and breed. The loss of a nest might mean they never raise young. The western snowy plover (Charadrius nivosus nivosus) is a small shorebird, about the size of a sparrow, that lives on our sandy beaches. Their cryptic coloration helps them blend in against the beach – can you spot the plovers in the picture above? Key field marks are the black bar on their forehead and dark patches behind the eye and on the neck. The Pacific Coast population has declined precipitously from it’s historical numbers, and is listed as threatened by Oregon and the United States Fish and Wildlife Service. 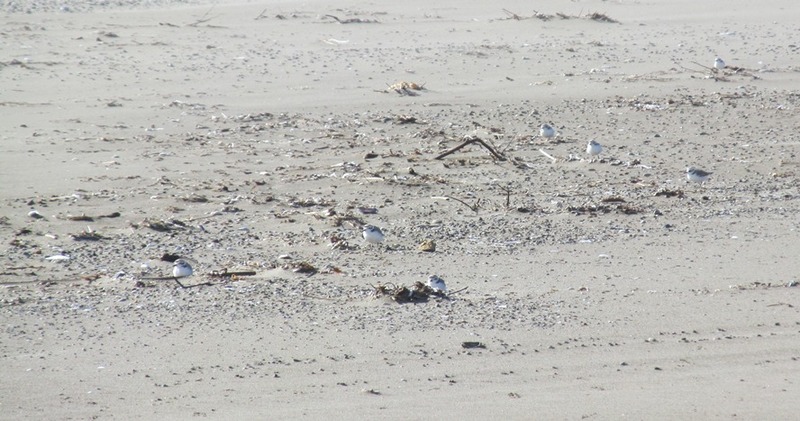 Plovers forage among the wrack line and nest in the dry sand with little to no vegetation cover. Well-camouflaged, snowy plovers often crouch in depressions in the sand or hide behind driftwood to shelter from the rough ocean winds. With the invasion of European beach grass, our Oregon beaches are getting more and more narrow, pushing recreationists and plovers into tight proximity. It can be hard for the little birds to raise their young amidst people and dogs at play. Three main factors threaten their survival. Predators—some native, some introduced by people—take more plovers than are replaced by natural reproduction. When plovers are nesting, feeding and raising their young, they have a harder time surviving if people harm or disturb them. To help the plover survive and recover, all three forces—habitat, predators and people—are part of the solution. Please help these birds by respecting their nesting areas while you enjoy the the beach.